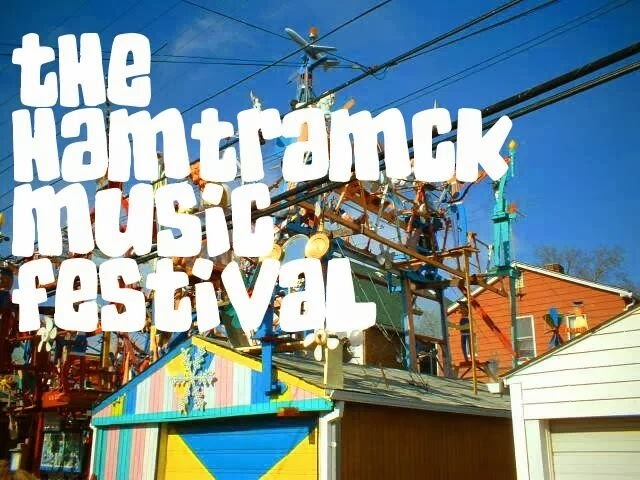 The Hamtramck Music Festival 2014 "All Tomorrow's Paczki". The primary sponsor, Ben's Encore, is a charitable organization, established in the name of Benjamin Borowiak, that helps provide opportunities for aspiring musicians and expand music education in the metro-Detroit area. Pre-party on Thursday, March 6, at Smalls Hamtramck. 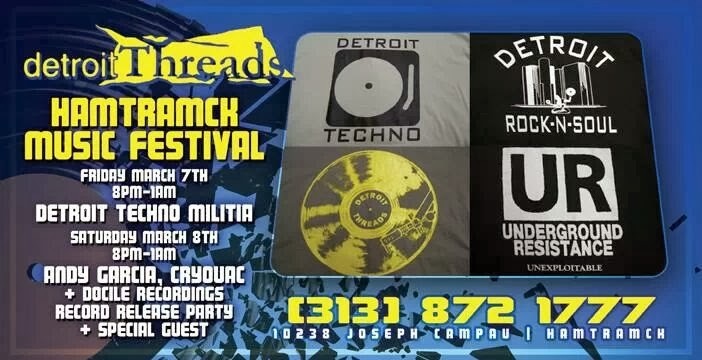 Detroit Threads = Will Call & Wristband sales on March 7th & 8th as well. Detroit Area Dork: What was the impetus for creating this festival? 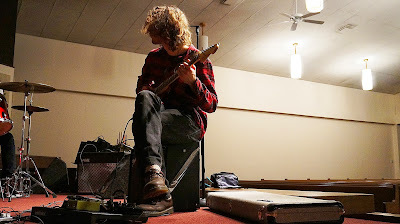 Eugene Strobe: I think a lot of people in the city really felt like they wanted a music festival at the beginning of March, and to keep it around the perimeter of Hamtramck, and the bars of Hamtramck. I think the cool thing about previous festivals is the proximity; being able to walk from bar to bar. Have be very centralized, and localized. It's been talked about for the past year, doing something pertaining to that. Packzi Day is a big celebration here in Hamtramck, and it's been talked about amongst the bars that they wanted to extend Packzi Day somehow. Turning it into Packi week. 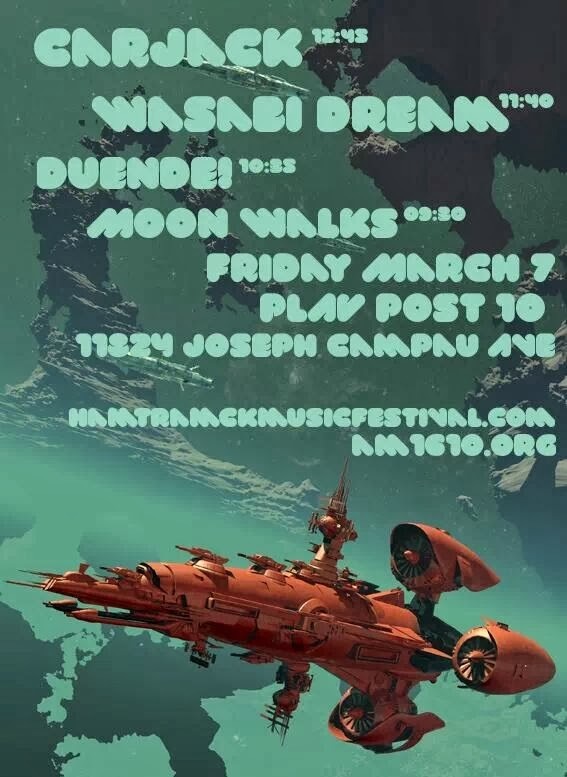 We thought putting this festival at the end of Packzi week really helps that continue, and helps that grow in terms of something to do in Hamtramck that first week of March. 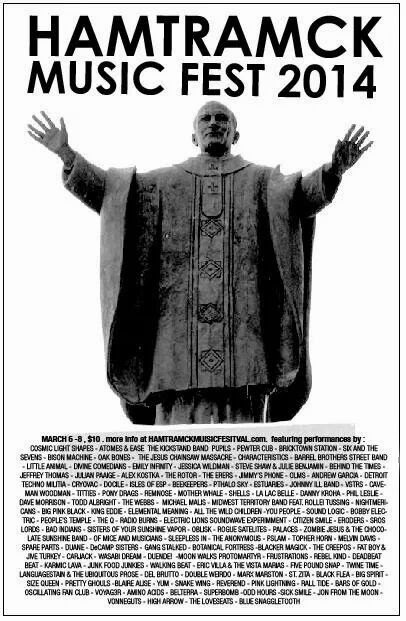 D: Would this festival still be happening if the Blowout was still the way it used to be? E: Uhm...that's a good question. I think it depends if the Packzi people want to have a festival separate from the Blowout. I think that because there was a little bit of a vacuum when the fest moved dates, and altered locations, I think there was a vacuum that was created. There was nothing there to take the place of it. It really spurred people on to do something this time of year, and around Packzi Day, and Packzi week. 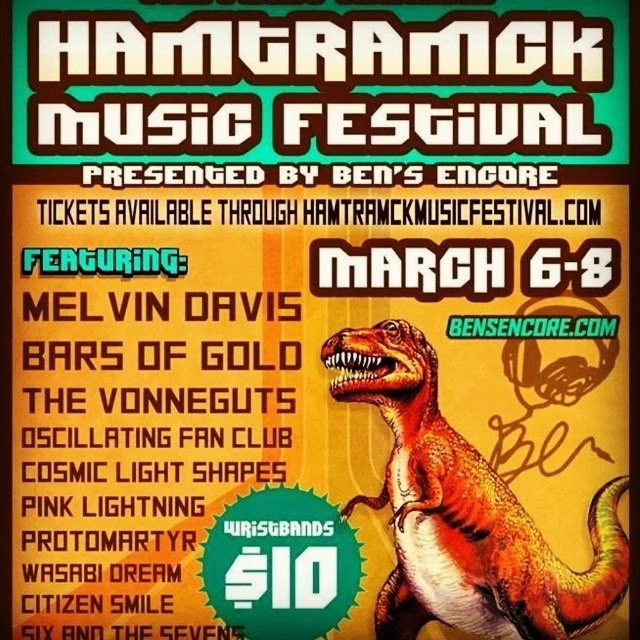 But yeah, if the Blowout were still here in Hamtramck, the first of second week of March, then the energies put into this festival might have been put into something else, some other time. There was definitely a vacuum that was created, and this is the result of that. D: Do you think that the Blowout belongs to Hamtramck, or the Metro Times? E: Well, I think legally these days, it belongs to Metro Times. You'd have to check with other folks, but I think they own the name "Blowout" now, I believe. So they can pretty do whatever they want with it. I don't know if it started out that way. 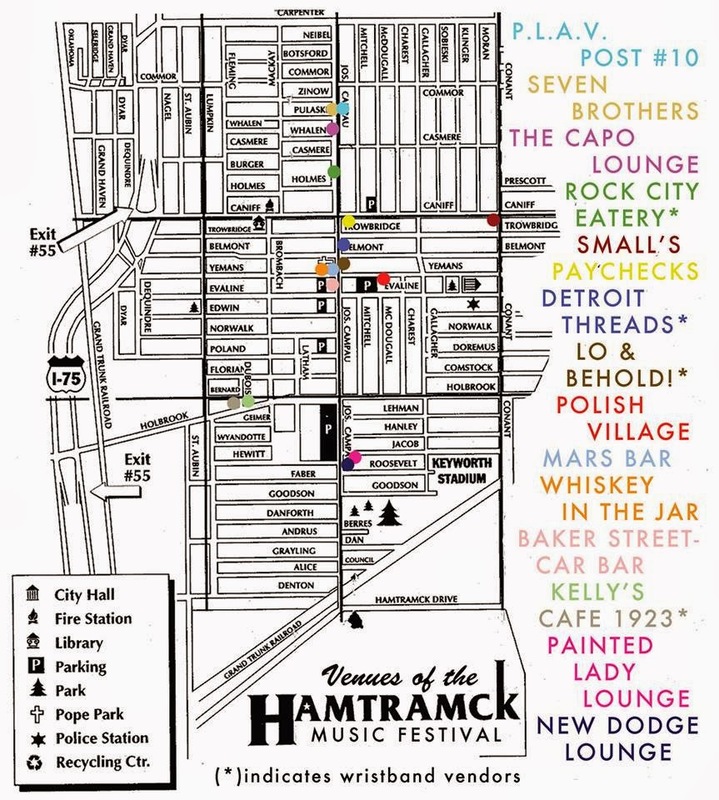 From what I gather, the festival became what it was because of Hamtramck, because there are so many artists, musicians, bars, and clubs in Hamtramck. That was the one centralized location where something like that could happen. I think the Metro Times was one of the main sponsors early on, then they became the main sponsor, then became the owner. As far as I know, that was the progression that happened. Again you might want to check some of those facts to be certain, but I think the reason the Blowout became Blowout was because of Hamtramck; the bars, and clubs, and close proximity, and the artists, musicians living and doing their thing here. D: Did you have any involvement in prior Blowout festivals? E: I've played in prior Blowout festivals. I've worked at bars during prior Blowout festivals, but not in terms of organizing or arranging. I've organized concerts before, productions before. I've done that kind of work. Nothing with Blowout in terms of the organization or production of it. D: Tell me about the Hamtramck Music Festival Committee. E: The Hamtramck Music Festival Committee, the genesis of it was our first organizational meeting, which was January 28th. We invited people who were interested in coming down and giving ideas, and being part of this festival. It was open invite. There wasn't closed doors or anything like that. Whoever showed up was officially on the planning committee. If you were in attendance, you were one of the initial planners. Of course from that initial group of people just coming down and giving ideas, a number of people took on responsibilities. The folks that took on the responsibilities to actually make the fest happen are probably now the committee members in terms of organizing, planning next year, who's playing next year, and recruiting other people to help out. In essence there are about two dozen people in the overall committee, but there's probably a dozen, or half dozen doing the brunt of the work in organizing the festival. D: How many venues do you have? E: We currently have 17 venues. Waiting on confirmation for one more. 17 or 18 venues if terms of actual music for the festival weekend. On top of that we have vendors helping us out in terms of selling presale wristbands. A number of record shops in town, as well as other locations here in Hamtramck like Cafe 1923 coffee shop, Detroit Threads, Rock City Eatery, Lo and Behold, and Record Graveyard. Places like that are helping us sell wristbands presale. There's vendors, and there's actual venues where we're having live entertainment. D: Looking at your list of venues online, it looks like you have several venues that haven't participated in the Blowout in several years. Did you make it easier for venues to participate, or add some new kind of enticement? E: Really the only enticement is wanting to be part of a really fun and great festival. Our original organizational plan was to take venues that already have shows, and ask them if they want to be a part of it. If they were, their existing bookers would book two nights, and be under the umbrella of the festival. We're leaving it up to the venue to book the entertainment and then get back to us. So we're not telling the venue what to do anything different from what they already do. Every venue knows what's best for them, what works for them. On top of that, venues that normally aren't housing music or entertainment, we assign someone to go talk to their ownership and management, ask if they want to be a part of it. If they said yes, then the person who went over there would in essence be the booker for that venue for the festival. They would pool in the equipment, pool in the bands to make that venue a viable place to go for the festival. I don't know what previous music festivals have done, but we thought that be easiest. Keep it very grassroots. Just ask them if they want to be a part of it, and if yes, then we'll help you produce your nights, help make it part of the festival, and make it great. D: So there's no one central person booking all of these venues? E: Correct. Each venue has a separate booker. Whether it's Cafe 1923, or Rock City Eatery, or Small's, or Painted Lady, they all have their own booker. Either it's someone that's preexisting, or someone we've assigned, or sometimes volunteers to become the booker for that venue for that weekend. So every venue is pretty much their own thing. D: There doesn't seem to be any large venues, like the Columbus Hall, or anything like that. E: We looked into doing the Columus Hall. We looked into doing the PNA, and things of that nature. I think the charm of Blowout also is to be in a small club, and to see bands in that setting. I think when you go to the larger halls, specifically if they're not meant to have shows there, the acoustics get kind of crappy and cruddy. We have acoustical type troubles that happen at larger type venues like that. Also I think keeping the venues smaller in terms of capacity, makes it feel more intimate, makes it a lot more personal. We just felt that the existing bars and venues in Hamtramck would be a better setting for that. On top of that, some of the rental halls have actual rental fees. 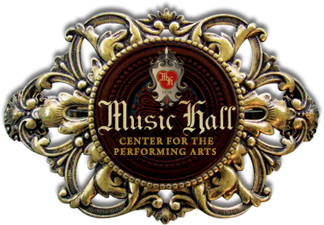 We're keeping our fees really low, and we're keeping our wallets kind of tight, just because any proceeds that come out of the festival are going to a nonprofit called Ben's Encore, which provides opportunities for youth involved in art and music. We want as much extra money as possible to go to that charity. D: I read that the price of the wristbands will be $10. Do you think that's too low? E: I think that's a great price, because we have people that complain about beer that's more than $2 a can, and then you have people who are willing to pay $8 for a pint. 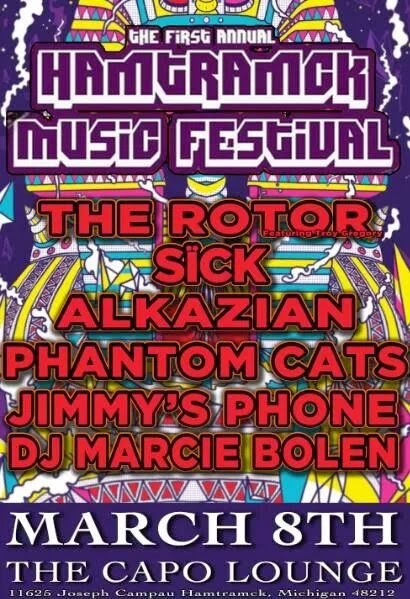 I think a $10 price for a wristband for 3 nights of music, 140 bands, is a great price. We could make wristbands $15. We could make it $20, but we think that's kind of defeating the purpose. We want to involve all the community. We want to involve people. It shouldn't be a financial thing. It should be a participation thing, an involvement thing. That's why we kept things at $10. I thought that's really fair. If we sell a lot of wristbands, and hopefully we do, we're going to be happy with those sales. D: At $10 a wristband, will you be able to pay the bands anything? E: The bands, that's an incentive that we talked about a lot, in regards to what bands get. I've been playing in bands since I was 13 years old, 14 years old. I've been doing it for a long time. I think just being part of the festival is a great perk, because it's a great thing. We don't have a lot of money, and we don't have a lot of sponsors this year, paying bands will be difficult in a monetary way, but we want to pay bands with wristbands, extra wristbands. They can get their friend, and the girlfriend, or their boyfriend in. If they bring equipment, because we're sharing backlines so there's more room in each venue to have people watch you, as opposed to having stacks of amplifiers, and stacks of drums blocking the bathrooms, blocking the bar, and blocking the door to get in. If you bring equipment in, you get a wristband. There's little perks like that. Each booker is responsible for providing perks for their bands. I know a few bookers are trying to get a keg of beer for their bands. There's little things like that, and it's not across the board. Again, this is very grass roots. We're not dealing with mega sponsors here. If it becomes a super successful festival, and if the charity is satisfied with the money that they're getting from the festival, and there's a little bit left over, of course we'd love to give some to bands. That's probably not a conversation for this year, because it's grassroots, and our budget is really low. That could be a possibility for future years. D: What are the big expenses for the festival? E: We want people to be safe, and we want people to get around easily, so we're having Detroit Bus Company provide two large school bus shuttles for the festival. That's an expense. They've given us a bit of a deal off of their main rental fee. We have to pay for the shuttles, that's an expense. We have to pay for advertising for the festival. Print ads cost money. We want people to know it. There's no sense having a festival if no one knows about it. You have to promote a little bit. Aside from that, there's a few loose ends. We have a little emergency fund in case equipment breaks, or a P.A. breaks, or if something happens, we can rent a P.A. real quick or what have you. So there's little things like that. Our budget is super small. Once the festival is said and done, we're going to have all the numbers presented publicly if anyone wants to see what we've spent, or what we did, or where the money goes to, where the money went. Our budget, currently, is about $5000. I think the Stooges recorded their first record for $5000, so...whatever. 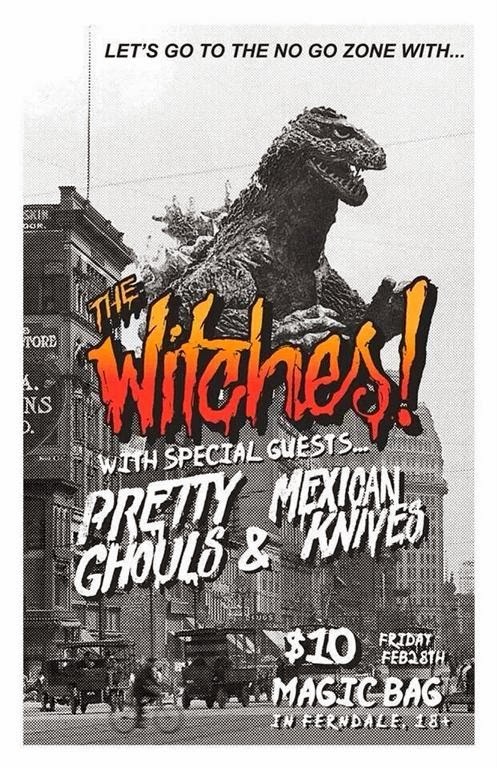 FREE VINYL FRIDAY - The Witches, Mexican Knives, Pretty Ghouls - Magic Bag Ferndale TONIGHT!!! MCB has a couple of fresh vinyls and a few more tickets to roll out for this dope show. The Magic Bag for the stash of free tickets! to win a pair on a limited edition yellow platter! It may be February, but we’ve got a night of Witches, Cutthroats and Ghouls for you! 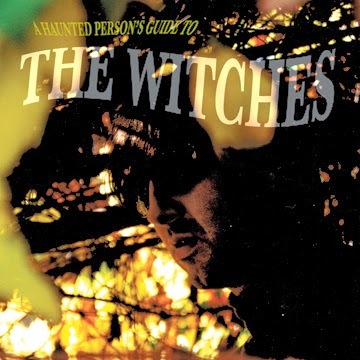 The Witches frontman Troy Gregory was so in demand as a sideman that he had to put the band on an indefinite hiatus as he toured the world performing with The Dirtbombs, Rodriguez and Crime & The City Solution. Now, after a couple of years of globetrotting, Troy decided it was time to get back to The Witches. Drop in as the band debuts a revamped line-up and a batch of new tunes. Two of Detroit’s hottest up and comers, Mexican Knives and Pretty Ghouls open the show! It's ELVIS night! Wear your jewel-clad bodysuit and start growing out your sideburns now. There will be prizes for all you hunks of burning love. 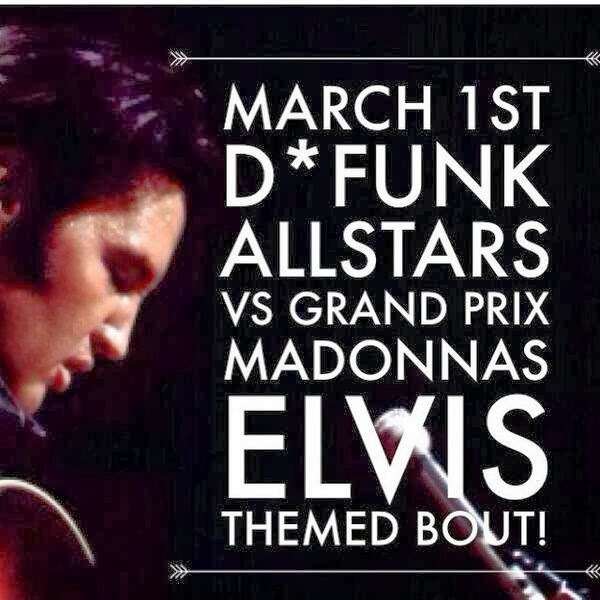 Doors open at 4:45 p.m. and the bout starts at 6. Tickets are $15. Up to two children 12 and under are admitted free with each adult admission. 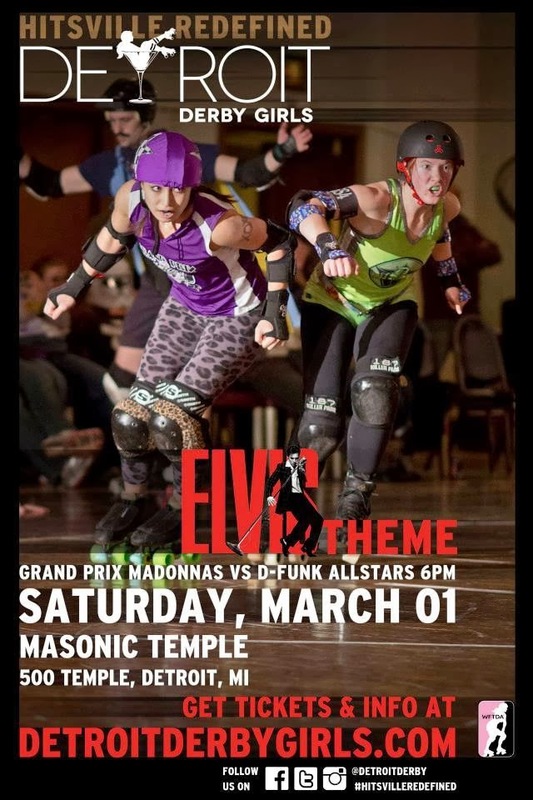 The Devil Elvis Show will sing the anthem and provide half-time entertainment. After party will be at Thomas Magee's Sporting House Whiskey Bar , 1408 E Fisher Service Dr, Detroit, MI 48207 - in Eastern Market. truTV searches for America's next great car designer in new series "Motor City Masters,"
Fasten your seatbelt. The search is on for America's next great car designer as truTV and Chevrolet team up on the brand new competition series Motor City Masters. Hosted by Brooke Burns (Baywatch, Melrose Place), Motor City Masters will pit 10 designers against each other to test their limits of design expertise and creativity. truTV has ordered 10 episodes of the Motor City Masters, which is being produced for the network by Bunim/Murray Productions (Project Runway, Total Divas) and The Story Lab, a division of Aegis Media. 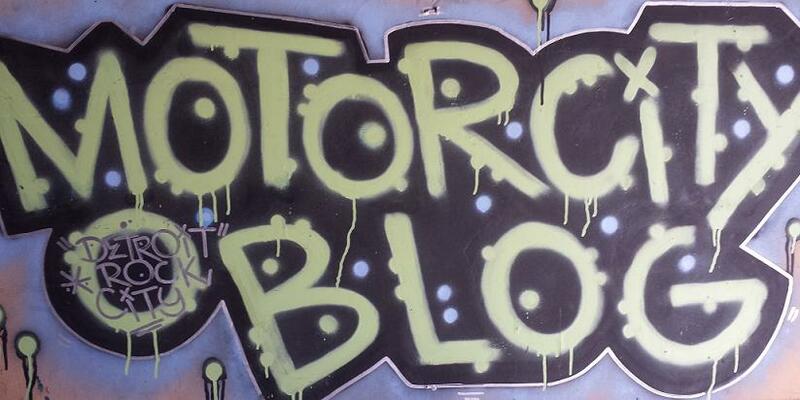 Motor City Masters is set to go into production the week of Feb. 24 in Los Angeles, with plans to premiere on truTV this summer. The exciting season finale will then take place in the Motor City itself – Detroit – and will provide one final show-stopping challenge. "As truTV's first venture into the reality-competition genre, Motor City Masters marks an important step in our strategy to diversify truTV's programing slate and develop the truTV brand," said Chris Linn, president, head of programming for truTV. "Cars are a huge part of American pop culture, and people are more interested than ever in how design meets function to impact our everyday lives. We are extremely proud to be working with such an iconic American brand as Chevrolet, as well as the top-notch team at Bunim/Murray Productions." "This is going to be a really fun competition for the designers," said Jonathan Murray, chairman of Bunim/Murray Productions. "The challenges they face will push them to really think about what the American public wants in a car and how the car can better serve their needs." "Creating vehicles with great design and performance that live up to the Chevrolet name will be a challenge for the participants," said Tim Mahoney, chief marketing officer, Global Chevrolet. "We look forward to seeing the top two designers here in Detroit in a few weeks for the finale." Motor City Masters will bring together 10 experienced designers, with various specialties and backgrounds, all of whom share a passion for car design. 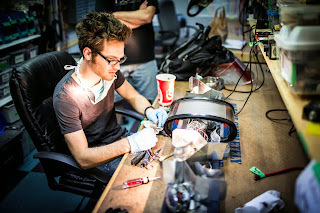 In each episode, the contestants will have the ambitious task of creating new, fully functional (though not street legal) concept cars based on a theme that will showcase the each competitor's unique personality. Challenges on Motor City Masters will explore various aspects of design, inside and out. The designs will be judged by Jean Jennings, president and editor in chief of Automobile Magazine and internationally renowned car designer Harald Belker. They will be joined each week by a special celebrity guest judge. Competitors will be judged on their creativity, execution and forward-thinking design, among other criteria. The field will narrow with each elimination challenge until only the top two designers remain. These two competitors will then face off in front of Chevrolet's world-class car design experts, after which only one designer will be crowned "The Next Great Car Designer." The winner of Motor City Masters will receive a brand new 2014 Camaro Z28 and $100,000 cash. The winner will also be named a Brand Ambassador, with the opportunity to showcase his/her designs at major auto show exhibitions. Executive producers for Motor City Masters include Jonathan Murray, Gil Goldschein, Rick de Oliveira and Scott Freeman from Bunim/Murray Productions, as well as Lisa Eisenpresser from The Story Lab. Kirk Durham from Bunim/Murray Productions serves as co-executive producer. 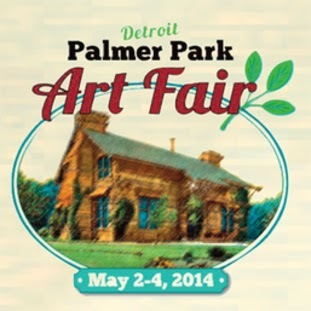 The Palmer Park Art Fair brings a high quality fair back to Detroit. This is the site of the first art fair in the city, a groundbreaking event in the '70s. The beautiful park along Woodward Avenue, the major road to the suburbs, gets tens of thousands of vehicles driving by each day. To enhance the event we are working to entice thousands of dollars in pre-committed purchases to assure robust sales for artists. Neighborhood organizations are coming together to bring buyers, and five major Detroit artists are collaborating with us to make this a wonderful experience. The community is working together to bring back this venerable event to a reinvigorated neighborhood. Late January of this year brought the fourth release- Maui Tears -from Northern California's Sleepy Sun. This new release has a classic psych rock approach detailed with refined touches of dream-pop, fuzz-folk, and jam band facets. I would dub Sleepy Sun's sound as Sun-gaze to separate them from the dark stale-air genre insinuations they may succumb to. They are an oxygen rich breath of crisp California air. 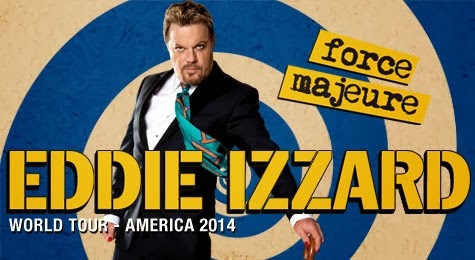 They tour extensively having just visited Detroit in November of last year and head to Europe in April- Brilliant! A perfect pairing for this show- Jet Rodriguez - a meld of amercicana, psychedelic, and blues-rock sounds that deters a definite labeling. 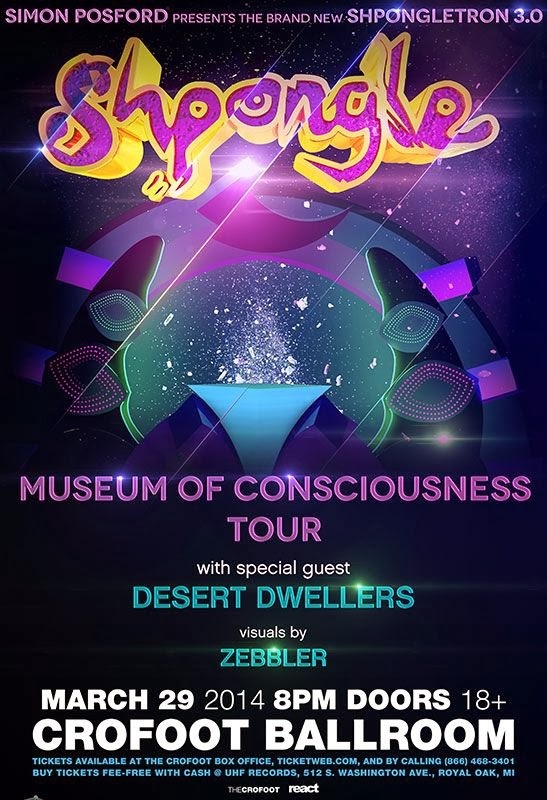 Their page on Facebook says Psychedelicate- Interesting. MCB has a couple sets of tickets to roll out for this fantastic show. If you haven't caught The Witches yet do yourself a favor and get down to the Magic Bag for a night you won't soon forget. stay tuned for some free vinyl on friday if we do our job right! 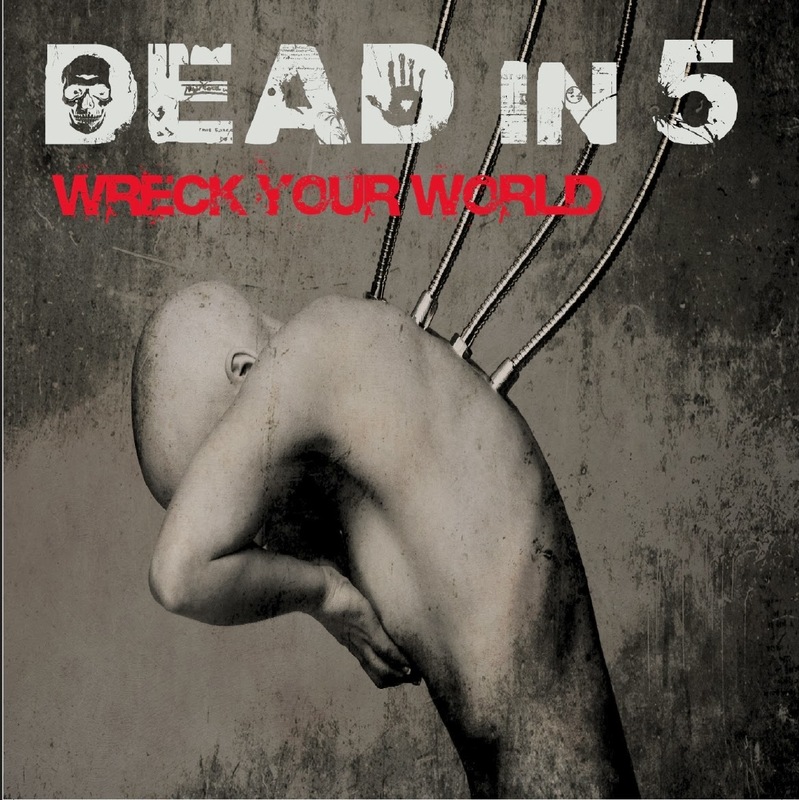 DEAD IN 5 "Wreck Your World" CD Release Party! 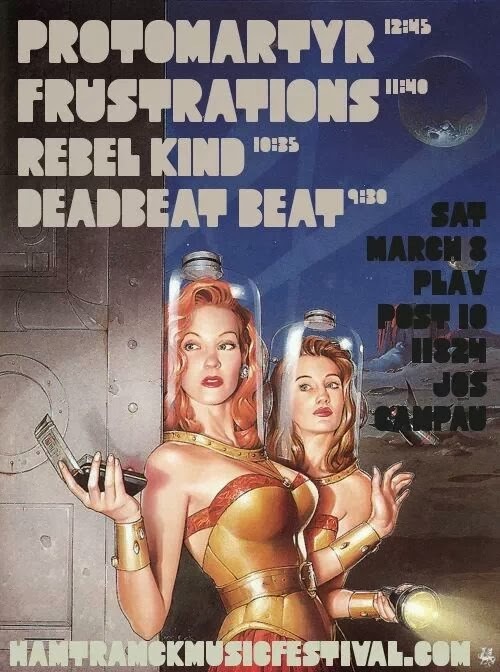 Outlaw rockers Dead in 5 are hosting a raucous CD release party for their brand new disc “Wreck Your World” at the Token Lounge in Westland this Saturday March 1. 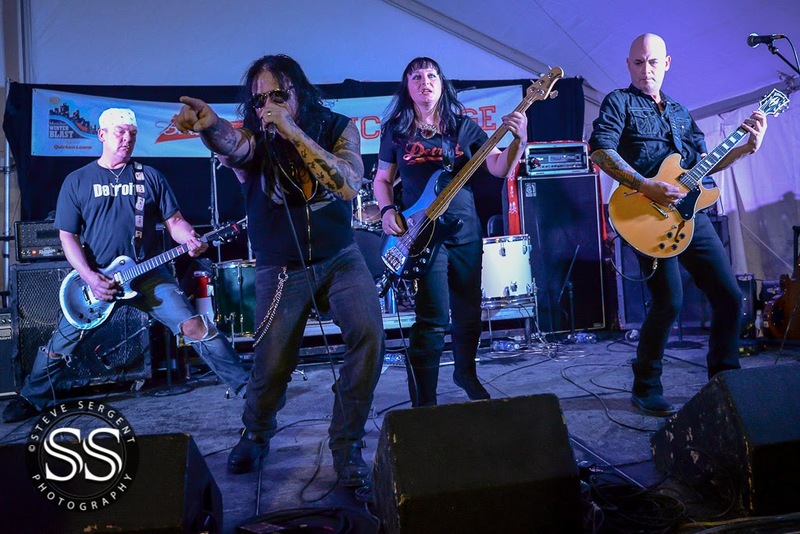 This fierce five-piece crank out original down and dirty rock, evoking a sonic mash up of Soundgarden, Clutch, Led Zeppelin and Rob Zombie, fueled by Detroit muscle. Joining Dead in 5 at the Token are Toledo sleaze metal masters Downspeed, female-fronted rockers Harlow, and Ann Arbor’s unruly Wild Savages. Rock N’ Rummage will also be on hand – hawking their affordably cool wares. Additionally, locally produced Harvest Honey plus face melting hot sauce by Dead in 5 singer Robert Libres will be available for sale at the show. Further adding to the festivities will be a provocatively shaped ice luge with sinful shot specials, and snake charming belly dancing, and tarot card reading by Shetan Noir. Doors are at 9 pm; admission is $8 for ages 21 and over, $10 for 18-20. “Wreck Your World” includes 11 scorching rock tracks –7 of which are featured in the movie, “Pro-Wrestlers vs. Zombies” starring WWE legends “Rowdy” Roddy Piper, Shane “The Franchise” Douglas, Matt Hardy, Kurt Angle and more. Dead in 5 were tapped to contribute 8 songs for the horror movie, which hits screens nationally this April. 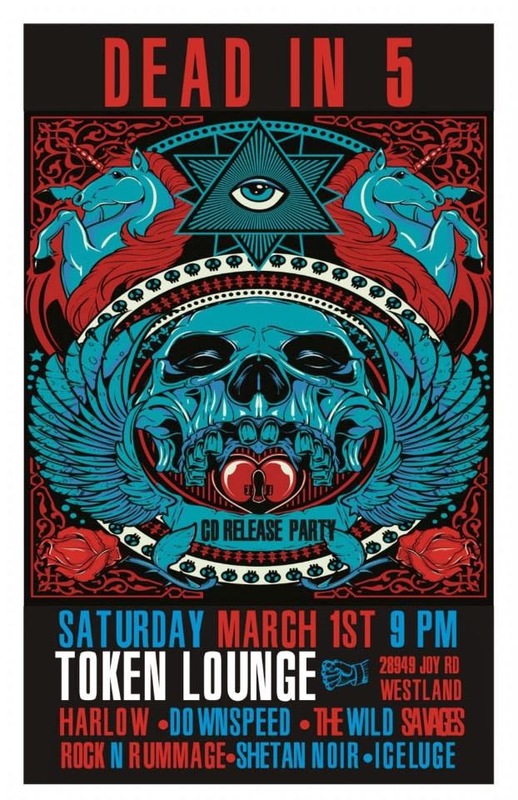 The Token Lounge is located at 28949 Joy Rd., in Westland, Michigan. FERNDALE, MI (February 20, 2013) Artists of all mediums seeking to make connections with other local creators and crafters can gather for the Ferndale Artists Roundtable February 27 at 7 pm at the Ferndale Public Library for discussions and demonstrations in the Community Room. "Finding a creative community can provide so much support and inspiration," says Lindsey Harnish, a member of FPL's Art and Exhibitions Committee and co-creator of its Roundtable program." The Roundtable meets on every fourth Thursday of the month. At 7 pm, people can mingle and talk over coffee, share portfolios and have discussions covering techniques, potential collaborative projects or local calls for art. All are encouraged to bring anything they would like to share, (business cards, works in progress, favorite art books, or just passionate views). This Roundtable edition features Matt Oehrlein of i3Detroit, Ferndale's "hackerspace"
At 7:30 p.m., Oehrlein will talk about this community-operated workspace where people with common interests, (typically in computers, technology, science, digital art), can meet, socialize or collaborate. Oehrlein will highlight resources at i3Detroit and how they can be used to by artists for imaginative new projects and explore the balance between technology, art and culture. Among their on-site resources are tools and machines for woodworking, metal working, welding, electronics and crafting. Upcoming Roundtables include Madeleine Barkey, on March 27, who will demonstrate book binding techniques. On April 24, Jay Harnish will present a workshop on Sacred Geometry, geometric shapes and patterns that have reoccurred in nature and art since ancient times that have symbolic meaning. Other Roundtables may include encaustics, welding and glass blowing. Harnish envisions the Rountable to "be like a bit of a casual show-and-tell opportunity for local artists. This area is so creative and we're hoping this is a way for neighbors to find each other and interact." The Ferndale Public Library Art and Exhibitions Committee's mission is to promote and foster an appreciation of two and three-dimensional art for library patrons, through exhibits, lectures, and an expanded collection of art books. The Ferndale Public Library promotes lifelong learning and personal development for diverse audiences of all ages by providing collections and services that educate, inform, enrich, and entertain. The Library supports civic engagement and serves as a public commons where a diverse Ferndale community connects and shares ideas. It is dedicated to the principles of intellectual freedom and community service. NEW WAY BAR welcomes - for one evening only!! 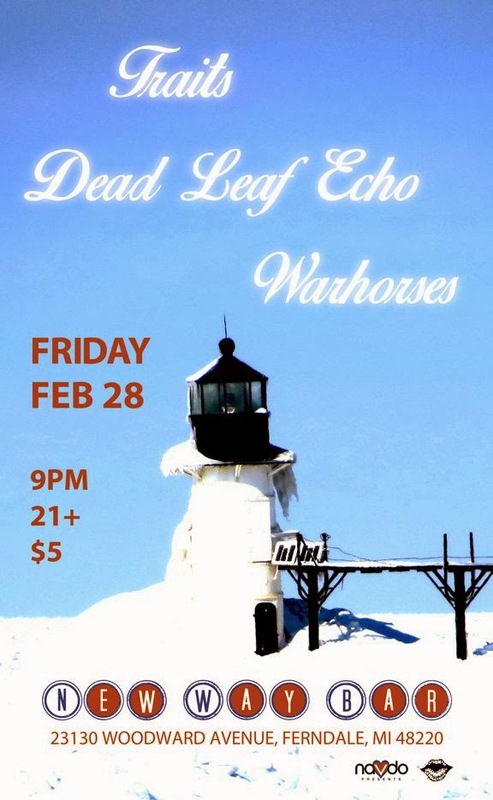 TRAITS, Dead Leaf Echo (NYC) and Warhorses. Tickets available at the Crofoot Box Office, online & by Phone: (866) 468-3401. Tomorrow night is your chance to check out a great new band making waves out of Florida, Roadkill Ghost Choir. Think early My Morning Jacket and early Wilco: great alt-country tunes mixed with some psychedelic edges. The band will join the bill with Caveman at the Magic Stick on Feb 26. 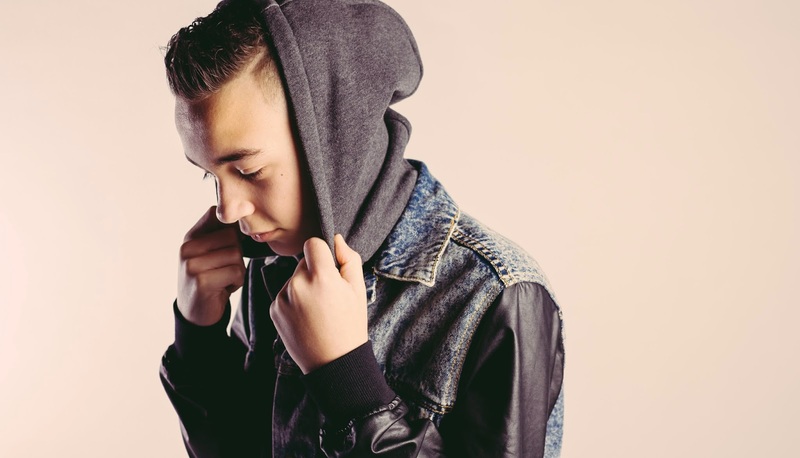 Rising pop star Alex Angelo will be performing this Sunday at the Royal Oak Music Theatre opening for Austin Mahone. Alex Angelo is a middle school teenager from Cleveland, Ohio. He started mixing at age 10 using his dad’s ipad. Alex’s family moved and he needed to sell a skateboard ramp that couldn’t make the move. He took that money and bought some used DJ equipment that allowed him to take his new hobby from the iPad to the Technics 1200s. Within a couple years, Alex has opened up for several musical artists including Justin Bieber, Pitbull, Carly Rae Jepsen, Austin Mahone, Hoodie Allen, and more. He also enjoys DJ’ing at Quicken Loans Arena in Cleveland while the Cleveland Cavaliers are warming up on Kids Days. Austin Mahone has already made a huge name for himself at the age of 17. Check out these two very talented young men while you have the chance to see them at a intimate venue. We are just around the corner from the 86th Academy Awards and I am way ahead of my viewing than I normally am. For the first time in years I have seen all the nominees for the top 6 awards prior to the ceremony and have 14 of the 24 categories where I have seen every nominee in them. Only the short documentary section is blanked for me. This is a very good year for film and I think they did a decent job with the nominations. I know most of my favorites won't probably win but for the big six, here are my choices. I love the movie "Her" for best picture as it was the only film that I saw that really got me thinking after seeing it. You know that film that inspires you so much you are just a bit speechless afterwards. I think this is as close to a perfect film as you can get this year but it is a little too quirky for the top award with the Academy. I'm just glad to see it nominated. Too bad "Inside Llewyn Davis" didn't get the nomination here. Bruce Dern is my choice as best actor for "Nebraska" which is an amazing film as his best role ever. This is just a simple little film much like Lynch's "A Straight Story" and his portrayal of Woody is incredible. The range of emotions he portrays from his stubbornness to get to Nebraska to his moments of friendship with old friends, his character is never untrue and totally believable. We know he is not all there and doesn't always understand what is going on, but he has many lucid moments along the way which are delivered with pin point accuracy. Cate Blanchett as best actress in "Blue Jasmine" is the younger female equivalent of Dern's performance. She is really smart but socially inept. She loves her sister but thinks so much as upward mobility she has serious trouble with her more blue collar life choices. The ending with her on the bench just sums up everything about her and makes a powerful ending in one of the best later Woody Allen films. She is probably the winner here. The Supporting actor award is harder for me as I like both Jared Leto and Bradley Cooper but I must admit a soft spot for Barkhad Abdi for "Captain Phillips". Perhaps it is because it feels like they got a real African pirate to play the role, but this is a great first film and I feel it is just the most powerful of the performances in this category. Supporting Actress is a close call for me also. I think I lean a bit towards Lupia Nyong'o for "12 Years A Slave" over Lawrence just because I really thought she brought a lot of character to the film and it was hard to keep my eyes off her performance whenever she was on the screen. The last is my easiest choice for with Alfonso Cuaron winning best director for "Gravity" which is the most beautiful looking film on the Academy Award list. No other film has the same reach or look. This is an amazing film much in the way "Apollo 13" was in it's day. I think this film will take a number of the technical awards and deservedly so. I think Gravity will win the most Oscars because of the technical nominations though I don't think any film will get more than 5 awards. I hope the public will support the films on this list. People always complain about the lack of originality in Hollywood with it's sequels, etc but looking at the best original scripts for "American Hustle", "Blue Jasmine", "Dallas Buyers Club", "Her" and "Nebraska" shows some great quality if you make the effort. Let's not forget "Inside Llewyn Davis", "Mud", "Gravity, "Fruitville Station" and "All Is Lost" as other great original films this year. I also hope people will track down stuff like the short film "Helium" which tells a wonderful story of a dying young boy who is given hope of an amazing afterlife by a janitor, "The Great Beauty" which is just a visual tour de force even if the plot can be challenging at times or the documentary "20 Feet From Stardom" about some amazing background singers who might even be better than the acts they sing for. It was a great year for film and I look forward to seeing who will win this year. A triple bill of three up-and-coming bands comes to Pontiac’s Pike Room next Monday, March 3. 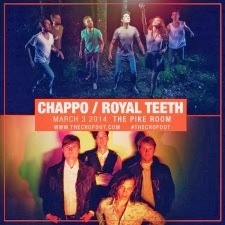 Chappo, Royal Teeth, and Parade of Lights are touring the US relentlessly together this winter in support of new releases. Brooklyn based Psych-rockers, Chappo, are releasing their sophomore effort, Future Former Self, next Tuesday, March 4th, via their very own record label, Rouse Records. Their best known single, “Come Home” was a staple on Siriusxm’s Alt Nation, residing in their top 18 countdown for a lengthy 20 weeks. “Come Home” also garnered notoriety due to use in an Apple iPod Touch campaign. 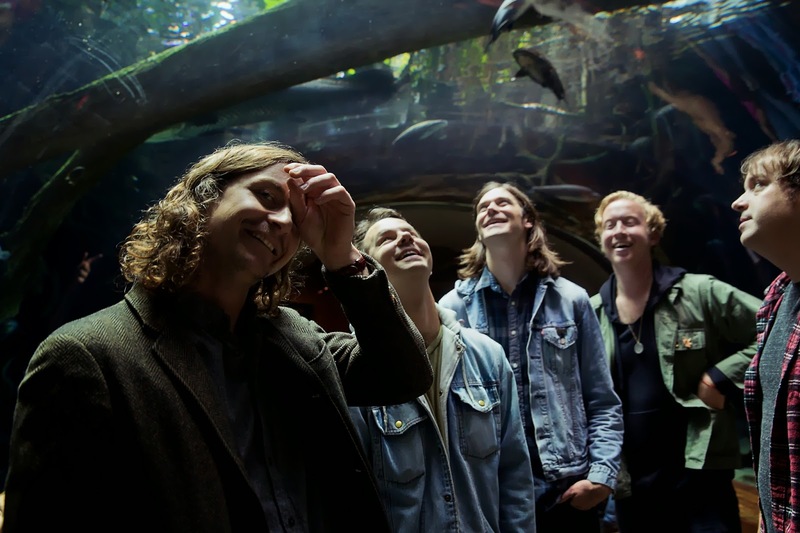 Pitchfork called the single “an excellently overstuffed garage psych sound.” Chappo have furthermore built up their fan base with opening stints for Of Montreal and Imagine Dragons amongst others. Their new concept album, Former Future Self, “tells the story of one man's journey to a black hole through a series of infectiously catchy tracks.” The upcoming album is a blend of folk rock, psychedelic rock, electronic pop and indie styled music. In a live setting, their psych-rock excellence is aided by costumes, confetti, props (including a ridiculously perfect psychedelic LED moon) and nonstop energy. Chappo have also built their reputation for releasing remixes which include Big Data’s “Dangerous” and Miley Cyrus’ inescapable “Wrecking Ball”, as well as regularly having their own work remixed. Chappo have worked the festival circuit playing Osheaga, Bonnaroo, Pop Montreal in the past and are already on the bill for this year’s SXSW. 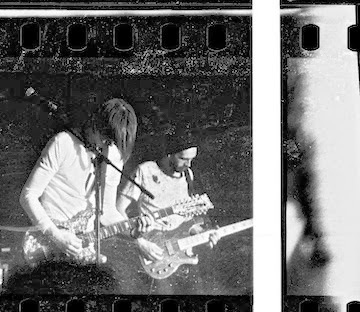 The insanely catchy, "I Don't Need The Sun", is the first single off of the new record. Royal Teeth are an indie-pop sextet from New Orleans. They released their debut album, Glow, in August of 2013 and their single “Wild” received a considerable amount of traction on alternative radio. They've played the Metro Detroit market a number of times over the past 2 years. They specialize in upbeat pop anthems that feature big choruses, a lot of percussion, and extremely catchy melodies. Their best known song, “Wild”, was licensed by State Farm for a nationwide commercial. Royal Teeth were signed by Los Angeles based label, Dangerbird Records, home of Silversun Pickups and Fitz and the Tantrums. Alt-Electro band, Parade Of Lights, will open the show. The Los Angeles based outfit is comprised of Ryan Daly, Anthony Improgo, Michelle Ashley and Randy Schulte. Famed electronic record label, Astralworks, signed the band in 2013. The band cites M83, Daft Punk, Depeche Mode and U2 as some of their influences. Their single “We’re The Kids” was played frequently on SiriusXM’s Alt Nation in fall of 2013 and received EDM remixes from Adrian Lux and Cash Cash. Their new EP is slated to be released sometime this spring. Giveaway! Win a signed copy of "Transgender Dysphoria Blues" from Against Me! Against Me! is excited to announce their upcoming Spring 2014 headlining tour. Touring behind the release of their critically acclaimed new album, Transgender Dysphoria Blues, an album that entered the Billboard Top 200 at #23, the band’s highest charting position in its 15+ year history, the band will begin its North American run on March 9 in Omaha, NE and will take in 21 evenings across the Midwest, West Coast, Canada. The tour will make its way to Austin, TX, for this year’s SXSW Music Festival from March 12-14. Information on tickets can be found on the band’s website, http://www.againstme.net/tour. Send an email to motorcityblog@earthlink.net to be entered for your chance to win a signed copy of Transgender Dysphoria Blues from Against Me! Contest ends February 25 at Midnight EST. Transgender Dysphoria Blues, an album recently called “one of the most incisive and life-affirming rock albums of the ’10s” by SPIN, is the intense follow-up to the band’s previous full-length, White Crosses, and stands as another major benchmark for the band and its career spanning 10+ years. Recorded at Studio 606, Earth Sound Studio, Motor Studio, Total Treble Studio and mixed by Billy Bush (Garbage, Muse, Tegan and Sara), Transgender Dysphoria Blues is an insightful and highly-provocative 10-song offering written by frontwoman Laura Jane Grace, whose material examines one’s grappling with gender dysphoria, the loss of a young friend and pure self discovery, as well as love and ultimate acceptance. Featuring Grace’s signature, explicit songwriting and dominant vocals, the album also features longtime guitarist/vocalist James Bowman, drummer Atom Willard and Fat Mike of NOFX on bass for “FUCKMYLIFE666” and “Unconditional Love.” Transgender Dysphoria Blues, Against Me!’s sixth full-length album, was released on January 21, 2014 via the band’s own label, Total Treble, in North America, Resist Records in Australia and Xtra Mile Recordings to the rest of the world. The album is now available for purchase through all digital retailers as well as the Total Treble webstore where exclusive vinyl and bundles are currently being offered. To celebrate the release of the album, Against Me! performed their song “FUCKMYLIFE666” on The Late Show With David Letterman. Watch the band’s performance on the show HERE. Additionally, a lyric video for the song can be seen HERE.You can also view the transcript from Against Me! frontwoman Laura Jane Grace’s recent Reddit “Ask Me Anything” session HERE. With a lineup firmly in place that includes new bassist Inge Johansson of The (International) Noise Conspiracy, Against Me! will be making the following appearances throughout North America this Spring with Laura Stevenson and Cheap Girls. Tour dates below. The Dirty Show closing weekend- SOLD OUT! Infected Mushroom Live at ROMT This Weekend! MCB Flyer Dump - Free tickets Black Angels - GO!